An adult bible study takes place every Sunday at 9:00AM in the Boardroom near Toronto Street. Come on Sunday mornings and join us in a study of the Bible. Contact Dave Phillips (905) 852-6852. Meets every third Tuesday from September to June at 7:30PM to discuss topics relating to church and community, to plan fundraising activities and socialize. Meetings are lively and fun filled. The group welcomes new members. The library was restored three years ago and serves our congregation on Sunday mornings. You will find a selection of many topics to chose from for your reading. This spring the following is a selection of adult and children’s books and also some DVD’s that we have purchased. “The Irish Country Doctor Series” by Patrick Taylor – a historical, fictional novel set in Northern Ireland. Two new biographies – “Under Their Very Eyes” – by Tom Hablin. His life as a bible courier to the Arab Nations and the other, the “Story of 7 Women who changed the Course of History” by Eric Metaxas. Prayer – “Pocket Prayers For Friends” by Max Lucado – simple prayers that bring joy and serenity. A fascinating book called “Angels By My Side”, by Betty Maiz. Two new adult DVD’s – “God Is Not Dead 1” – story of a university student who challenges his professor of Philosophy who declares God is dead. “God Is Not Dead 2” – story of a high school teacher’s response to a student’s question about Jesus and lands her in deep trouble. We found a new children’s book – “The Tale of Three Trees” by Angela Elwell Hunt. It is a folktale and is well written and beautifully illustrated. You are always welcome to drop by the library and check out our books, DVD’s, and our selection of bibles and reference book. You can talk to Jeanne Alexander, Irene Dimanis or any other member of our team that is on duty. This group meets to pray for the care and concern of the congregation. In addition to the support we give through Presbyterian Sharing and Presbyterian World Service & Development, St. Andrew’s – Chalmers also supports two missions directly. Francisco Coll School for children of families living in a dump near Guatemala City. An orphanage in Malawi for children who have lost their parents to the AIDS epidemic. This group meets every third Thursday of the month, September to June. The Women’s Missionary Society is a community of Christians whose purpose, in response to the love of God in Jesus Christ, is to encourage one another and all the people of the church to be involved in local and world mission through prayer, study, service and fellowship. The community food bank, Loaves and Fishes, is hosted in our building. Members of the congregation take an active part in the operation and administration of this important outreach program. 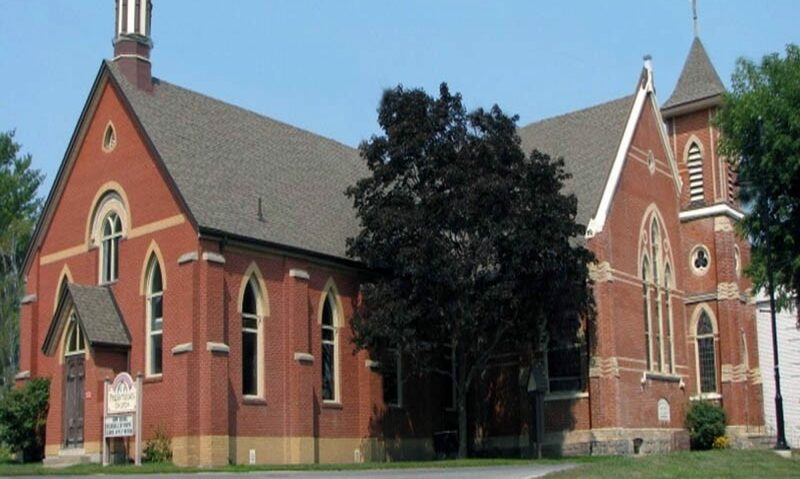 Donations may be dropped off at St. Andrew’s – Chalmers Presbyterian Church, Monday to Friday from 9 a.m. – 12 noon. Please call the church at 905-852-6262 before dropping off donations. Financial donations are also gratefully received as fresh goods such as meat, cheese and bread are purchased weekly. Financial Donations may be made by cash or cheque. Donations may be made by credit card through www.CanadaHelps.org (the Food Bank is charged a transaction fee of 4.9% using this method). All financial donations will receive a tax receipt.